When it comes to having a happy and healthy child, dentist visits are essential. However, it is common for children to be afraid of the dentist, which is mainly due to the sharp instruments dentists use. If you have a scared and anxious child, the last thing you want to do is force them into a dentist chair. Luckily, there are few simple tips to helping your child overcome their fear of the dentist. One of the most effective ways to help overcome your child’s fear of the dentist is to prevent them from being afraid in the first place. According to the American Academy of Pediatric Dentistry, you should take your child to see the dentist when their first tooth appears or by their first birthday. If you take them while they are still a baby, they see the dentist as a normal activity. Having your child going to the dentist young familiarizes them with dental procedures and allows to get comfortable with all of the professionals. Before your child sees the dentist for the first time, make sure to role play the visit at home. You want to make them as comfortable as possible, so make sure they know what to expect. Allow them to pretend to clean your teeth, and you can do the same. You should explain all of the procedures to them and act each of them out with your child. 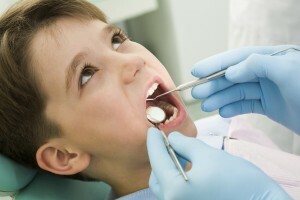 If your child knows what to expect, then they will be calm going into the dental visit. When it comes getting your child to go to the dentist, it is best that you do not bribe them, especially with any sweet treats. Bribing your child will make them even more apprehensive and wonder why you are bribing in the first place. It is best that you just praise your child after they goto the dentist especially if they do not have any cavities. This entry was posted on Friday, July 20th, 2018	at 3:15 pm	and is filed under Catonsville Family Dentist	. You can follow any responses to this entry through the RSS 2.0	feed. Both comments and pings are currently closed.